Top moments from the Pirates system! Plan something special for your friends, family and co-workers today! Whether you are a business, church group, service club, sport team, school, reunion, military group, or any other group of baseball fans, a Curve baseball game at beautiful Peoples Natural Gas Field will be the most memorable gathering you'll have this year. 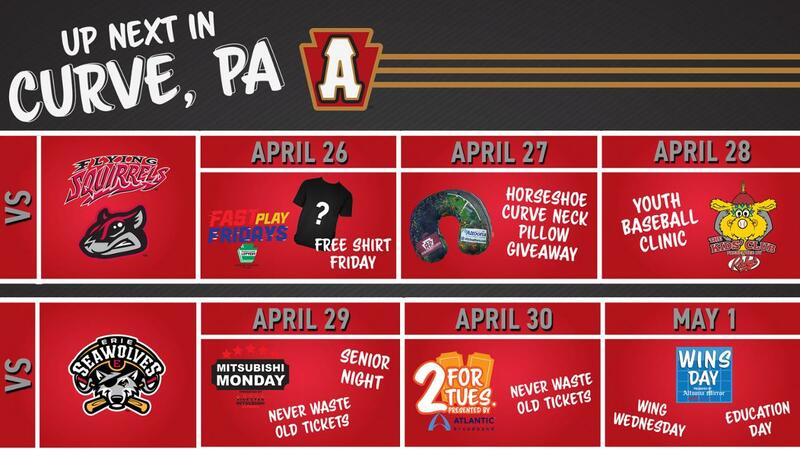 There's nothing quite like being a member of the Residents of Curve, PA as a season ticket holder! With special "Resident-only" specials and things like early entrance to the ballpark, being a season ticket holder has great advantages! Enjoy a night of luxury at Peoples Natural Gas Field. Our 20 and 36-person suites come with first-class amenities along with tempting food options and wait staff to fit your needs. Now in it's fourth year, the annual Game of Hope will feature the Game of Hope 5K in 2019! This race/walk will be in and around Peoples Natural Gas Field on June 1 with proceeds benefitting the Relay for Life of Blair. Game of Hope 5K Race participants can now purchase the Race Pack that includes registration to the 5K, one grandstand ticket to the Curve vs. New Hampshire Fisher Cats and one Game of Hope T-shirt. Luminaries are also available now.